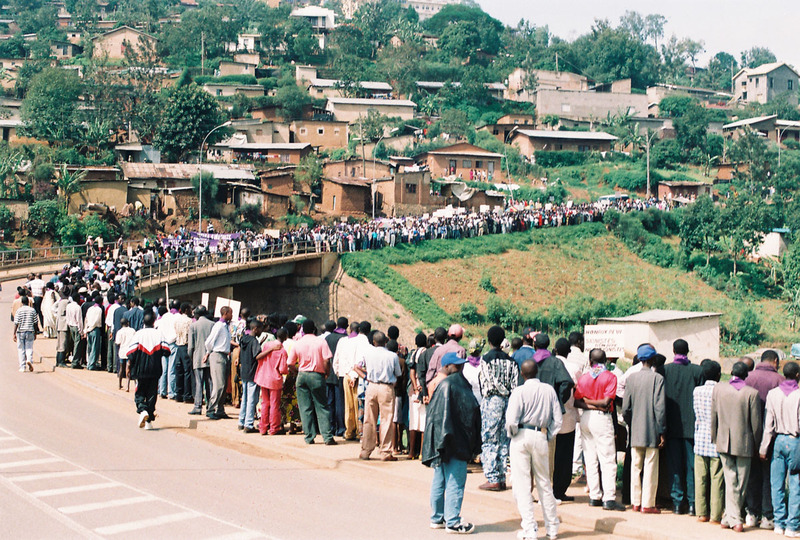 Commemoration march for the first anniversary of the genocide, 1995, Kigali, Rwanda. Photo: unknown. Retrieved by Delia Duong Ba Wendel from “130301-1-9655” Personal Papers, Rwanda. Politics is spatial; it takes shape all around us, in forms of inclusion and exclusion, geographies of power, and loci of resistance. The essays in this collection illustrate strategies of mobilization and control that emerge from buildings and landscapes as disparate as Rust Belt railway stations and rural Rwandan hills. With contributions from across the humanities and social sciences, this book reveals how spaces forge consensus and conflict, regulate movements and behaviors, and are produced by special interests, both local and global. Foregrounding spatial ways of understand the political worlds in which we live, Spatializing Politics: Essays on Power and Place fills a critical gap in scholarship on social relations and the built environment. In doing so, it encourages us to rethink the spaces we encounter—and construct—as agents of political influence, activism, and change. Delia Duong Ba Wendel is an architectural historian and cultural geographer who studies how communities rebuild and recover from conflict and disaster. Her current research focuses primarily on Central Africa and draws significantly from anthropology, cultural theory, and peace and development studies. She is completing her PhD in the history and theory of architecture and urban planning at Harvard University with a finishing grant from the American Council of Learned Societies and fellowships from the Social Science Research Council and the Edmond J. Safra Center for Ethics. Her teaching experience includes appointments as a visiting lecturer at Harvard and as a tenure track lecturer at the University of Edinburgh, where she taught courses in architectural and urban history, theory, and design, and in social studies, informed by cross-disciplinary pedagogy. Wendel's work has been published in the Journal of Urban Design, New Orleans and the Design Moment, and the Handbook of Architectural Theory. She is coeditor of Spatializing Politics. Fallon Samuels Aidoo is a historian of urban industrialization and post-industrial urbanism in the Americas. She teaches architectural and urban history from comparative perspectives, currently at Northeastern University and previously at Harvard, where she is completing a PhD in urban planning. She holds master's degrees in architectural and planning history from MIT and Harvard, where she studied the production and preservation of metropolitan infrastructure. Supported by the Tobin Project, Hagley Library, and Volvo Foundation, her research broadly concerns the role of nongovernmental bodies—corporations, consultants, and communities—in sustaining transport sites and services. She is curating a multi-media digital archive of historical records, artifacts, and plans that facilitates scholarly and popular engagement with railway conservation movements. Her previous works of public history informed Smithsonian and National Building Museum exhibitions. Aidoo's writing on suburban transit will be published in the Encyclopedia of Greater Philadelphia. She is coeditor of Spatializing Politics. The project's primary editorial advisor is professor K. Michael Hays, the codirector of the PhD Program in Architecture, Landscape Architecture, and Urban Planning; Associate Dean; and Eliot Noyes Professor of Architectural Theory at Harvard Graduate School of Design. From 2000 to 2009, he also served as the first adjunct curator of architecture at the Whitney Museum of American Art, New York. He was the founder and editor of Assemblage (1986–2000), an influential journal of architecture and design, and is the author of numerous books, including Modernism and the Posthumanist Subject (1992, MIT Press) and Architecture's Desire: Reading the Late Avant-Garde (2009, MIT Press). All of his work and teaching involve issues of ideological and protopolitical representations in architecture. As codirector of the doctoral programs, he oversees program content and planning, and advises on the development of the annual Cambridge Talks symposium. H. Fernando Burga is an assistant professor in the Planning Department at the University of Minnesota's Humphrey School of Public Affairs. He received his PhD in 2013 from the Department of City and Regional Planning at the University of California, Berkeley and holds master's degrees in architecture and urban design from the University of Miami. Burga's research explores equity and the politics of identity, race, and citizenship in urban design and planning policy. He combines ethnographic fieldwork, the study of planning history, and the analysis of urban policy to investigate the methods urban designers and planners use to address the needs of Latino immigrants and to assert their collective agency and build political capacity. His current project applies participatory action research and community design techniques to plan with undocumented Latino immigrants in San Jose, California. Kerry Ryan Chance is a political and legal anthropologist with a specialization in African studies and urban studies. She is a lecturer on social studies and an Oppenheimer Fellow at Harvard University. She joined the Anthropology Department as a College Fellow and American Council of Learned Societies Fellow in 2011 after receiving a PhD in socio-cultural anthropology from the University of Chicago. She has published scholarly articles in Cultural Anthropology, Anthropological Quarterly, Social Analysis, and Transition, among many others. She is currently completing a book entitled Living Politics that examines governance and political mobilization in three South African cities from the mid–1980s to the present. Chance's research has been supported by grants from the Fulbright Foundation, the Social Science Research Council, the Wenner Gren Foundation, and the National Endowment for the Humanities. Ryne Clos is a cultural historian of Latin America and a peace scholar interested in issues of mobilization, peacebuilding, and social justice. His chief area of interest and expertise lies in twentieth–century Central America; in particular, Nicaragua during the Cold War years. He is currently a doctoral candidate at the University of Notre Dame in history and in peace studies. His publications include the article "In the Name of the God Who Will Be: Mobilization of Radical Christians in the Sandinista Revolution," Journal for the Study of Radicalism (2012). Susan S. Fainstein is a professor and scholar of urban planning, theory, redevelopment, and comparative urban policy in the United States, Europe, and east Asia. Her authored works include The Just City, which received the Association of American Schools of Planning Davidoff Book Award; The City Builders: Property, Politics, and Planning in London and New York; Restructuring the City; and Urban Political Movements. In addition, she has published countless edited volumes, book chapters, and journal articles grounded in empirical study, planning theory, and issues of gender and social equity, among others. Fainstein has served as professor of planning at the Harvard Graduate School of Design, Columbia University, and Rutgers University, and was named Distinguished Educator by the ACSP for a lifetime of career achievements. Her emphases on progressive planning, meaningful reform, equity, diversity, participation, and material well-being for all city residents have guided robust engagements across urban policy, theory, research, and continents. Hector Fernando is a doctoral candidate in the Department of City and Regional Planning at University of California, Berkeley and a graduate fellow at the Center for Research on Social Change. An architect and urban designer by training, his research focuses on metropolitan Miami, where he investigates how empowered immigrant communities challenge institutional planning practices through material, legal, and cultural claims to the city. These interrogations are framed by an understanding of history, spatial analysis, ethnographic methods, and professional practice. Toni L. Griffin is professor of architecture and the founding director of the J. Max Bond Center on Design for the Just City at the City College of New York. An educator, social advocate, urban designer, and planner, her work has had broad impact on community and economic development in cities across the United States. Recent research, design, and policy projects include the Legacy City Design Initiative, which explores innovative design solutions for cities with shrinking populations, and the Detroit Future City plan, a comprehensive framework for urban transformation and resident inclusion. Griffin maintains a private practice in New York—Urban Planning for the American City—and was previously the director of community development for the City of Newark, New Jersey; the deputy director for revitalization and neighborhood planning in Washington, DC; and the vice president for planning and tourism development for the Upper Manhattan Empowerment Zone Development Corporation in New York City. Joy Knoblauch is a historian, theorist, and educator focusing on architecture's intersection with the social and medical sciences. She is an assistant professor of architecture at the University of Michigan as well a Fulbright scholar in philosophy and public health. She holds a PhD in the history and theory of architecture from the Princeton University's School of Architecture and has worked as an architect in Ithaca, New York and San Francisco. Supported by the National Science Foundation, the Canadian Centre for Architecture, and the Fellowship of Woodrow Wilson Scholars, Knoblauch's research has appeared in the essay collection In Search of the Public and in the journals Manifest, Architecture Theory Review, and Pidgin. Her forthcoming book, Going Soft, interprets institutional architecture as a symptom of larger political changes taking place in the United States during the 1960s and 1970s. Wanda Katja Liebermann is an architect and scholar. She received a doctorate of design from the Harvard Graduate School of Design in 2013. Between 1996 and 2007, she taught design at University of California, Berkeley, where she is currently a visiting scholar in the Department of Architecture. Her research focuses on theories and practices of architecture and urbanism in the United States and the European Union. It critically analyzes the relationship between architecture and embodiment across a range of spatial practices, from urban design to material conservation, connecting it to discourses of selfhood, agency, and citizenship. One such engagement is a project titled "critical non-compliance," where Liebermann translates her theoretical work on space and embodiment into design. Orly Linovski is currently an assistant professor in the Department of City Planning at the University of Manitoba, where she teaches studios and seminar courses on urban design and transportation. Her research, teaching, and public engagement are motivated by a concern for the social and political production of built form. Her work focuses on the nature of contemporary urban design practices, issues of equity in planning and design, and urban design theory. Linovski obtained her doctorate in Urban Planning from the University of California, Los Angeles and holds a Master of Science in Planning from the University of Toronto. Her work has been published in the Journal of Planning Education and Research, Journal of Urban Design, and Built Environment. She also served as editor of Critical Planning. Michael Mendez studies how the built environment, policymaking process, and social movements influence sustainability and population health in low-income neighborhoods and communities of color. His research is informed by urban planning, public health, and science and technology studies. He currently serves as the inaugural Provost Postdoctoral Fellow at the University of San Francisco, with an appointment in the Environmental Studies Department. His academic work is informed by his experience in the public and private sectors, including consultancy and leadership roles within the California State Legislature's Assembly Select Committee on Environmental Justice and Sacramento's Planning Commission. In these positions, he conducted applied research and actively engaged in policymaking processes. Mendez holds a PhD in environmental planning and community economic development from University of California, Berkeley and a master's in sity planning from MIT. Anh-Thu Ngo earned her PhD in social anthropology, with a secondary focus on film and visual studies, at Harvard University. Her dissertation explores emergent artistic expressions in the context of political repression and transforming market socialism in Ho Chi Minh City, Vietnam. Ngo's research and teaching focus on art, aesthetics, and media, experimental ethnography, gender, memory, phenomenology, political economy, and urbanism. Her scholarly production and art practice intersect through work in video, poetry, performance, and curation. Her background is in nonprofit administration in the arts and education sectors. Melany Sun-Min Park is a PhD student in the history and theory of architecture at Harvard University. Her research focuses on twentieth–century Korean architecture and, in particular, its relationship to professional organizations and institutions that emerged in the postwar period. Her current work examines the corporate history of modern architecture in South Korea and its intersection with political economy in the Park Chung-hee era. She holds a Master of Design Studies with Distinction from the Harvard GSD and has received fellowships from Harvard's Korea Institute and the Society of Architectural Historians. Her essay on Singapore's avant-garde art collective, the Artists Village, was published in the volume Home + Bound: Narratives of Domesticity in Singapore and Beyond, which she coedited, and her interview with Chi Soon, South Korea's first registered female architect, will become part of Mokchon Architecture Archive's oral history project. Margo Shea is an assistant professor of public history at Salem State University. She teaches undergraduate and graduate courses in public, local, and urban history and heritage, and museum studies. Trained in cultural geography, public history, and the study of memory at the University of Massachusetts, Amherst, her recent work has focused primarily on Northern Ireland. Her expertise extends to community economic development, service-learning, and campus-community partnerships. Shea is currently a Mellon Fellow and resident scholar at the Collaborative for Southern Appalachian and Place-Based Studies at Sewanee—the University of the South, where she explores how collaborative engagements of place and memory can aid community development and public health initiatives. The Harvard University Graduate School of Design is a leading center for education, information, and technical expertise on the built environment. Its Departments of Architecture, Landscape Architecture, and Urban Planning and Design offer master's and doctoral degree programs and provide the foundation for its Advanced Studies and Executive Education Programs. Spatializing Politics is the first book of the Harvard Design Series, published by Harvard Graduate School of Design and distributed by Harvard University Press.